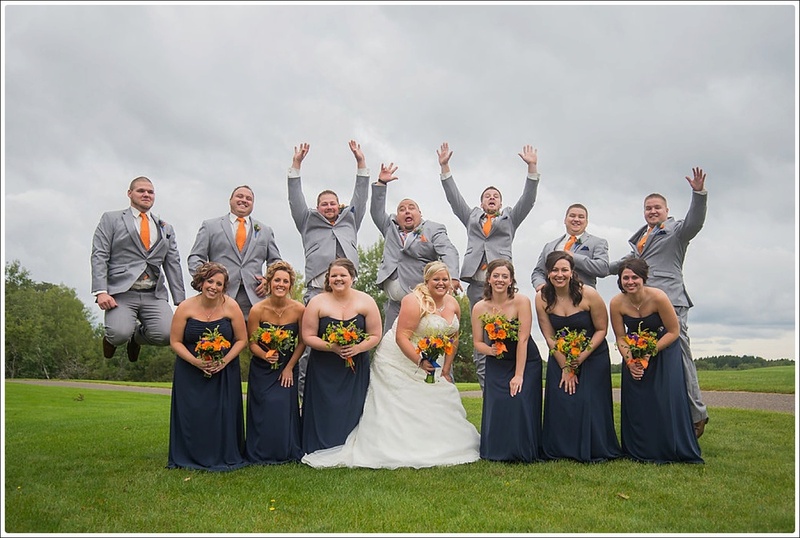 How fun is this wedding party?! I loved photographing Becky and Reed's day at The Refuge in September. The day was such a fun day all around. My day started in the bridal suite where I got to photograph the girls getting ready and hanging out. I think it's my favorite part of the entire day. I LOVE the getting ready atmosphere, the music, the memories shared, the nervous laughs, the ohmigosh-it's-my-wedding-day!!! !-comments, the fun - all of it. I also like to get some of the detail photos during that part of the day. First looks are also so fun. The nerves are peaking for both the bride and groom and then instantaneously there is major relief, happiness and excitement. The mood shifts and it's super duper fun. The wedding party let me be the crazy lady with the camera and were generally receptive to my "out there" suggestions which, I think, resulted in some super fun, unique wedding shots. Sometimes corralling everyone for wedding party and family photos can be a headache but when everyone cooperates it's pretty painless. And the result is photos everyone can appreciate for years and years. Right before the ceremony was about to start the skies opened and the rain started to fall. Guests and I watched the radar and waited it out a few minutes. Then the overcast skies stopped raining and the ceremony began. The rain was a good cover for Reed. 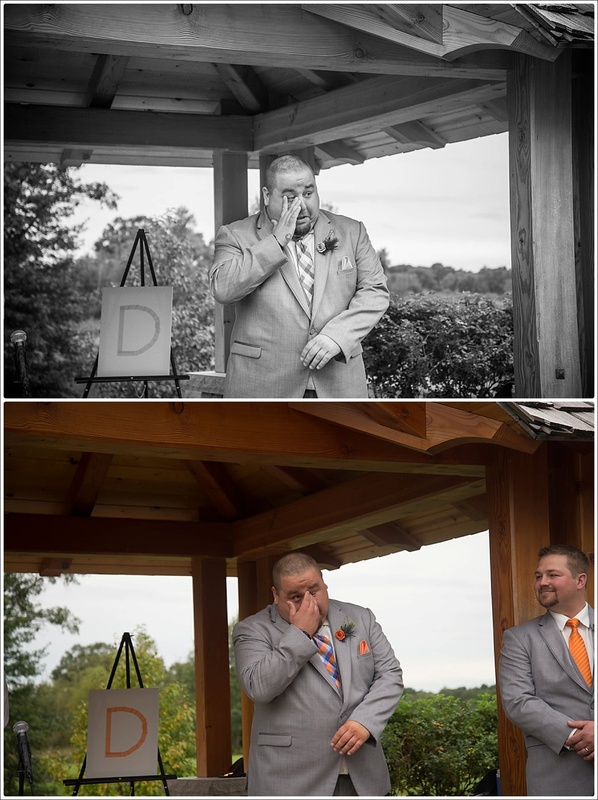 It was probably residual raindrops that he was wiping from his face as his bride walked down the aisle toward him, definitely not tears. 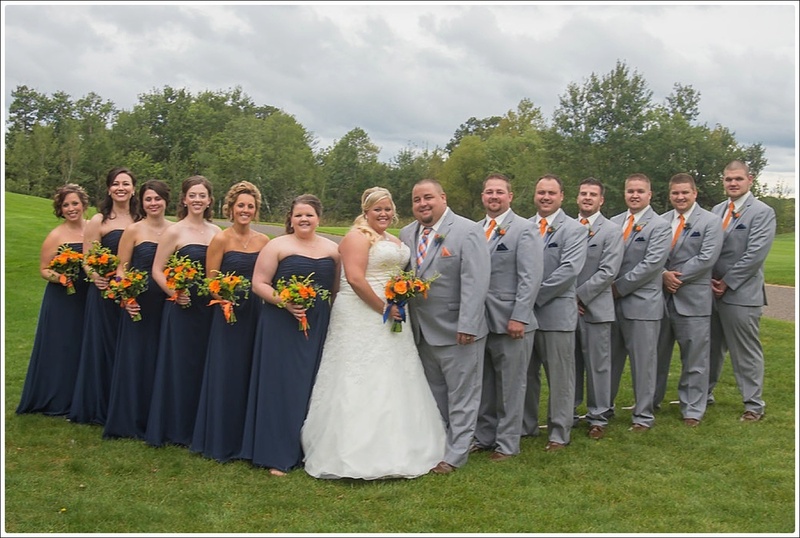 ;) The overcast skies helped to pop the gorgeous oranges and blues they choose for their wedding. Following the ceremony we snuck away with the bride and groom for two main reasons: for them to get some alone time to just take a breath and enjoy just being announced husband and wife; secondly for me to get some shots of just them. The golf course had some amazing areas for us to use for photos of the newlyweds. They were so sweet on one another and I loved capturing just them. 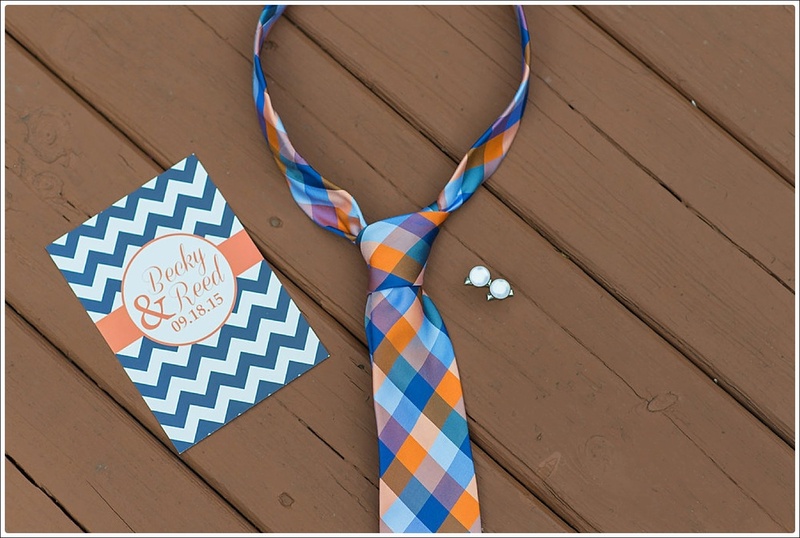 Their ceremony was adorably rustic complete with burlap and chevron. They had cute toasts, amazing dinner and a fun dance. One of my favorite parts of the day was when Becky surprised everyone, including her husband, by taking the microphone and singing beautifully. It was a perfect end to a wonderful day. I am so excited for Becky and Reed and wish them all the happiness they deserve!